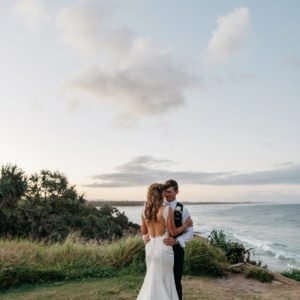 If you’ve been keeping up to date with our socials here at Tweed Coast Weddings, you may have heard a thing or two about a brand new barn tucked away in the mountains of Carool. 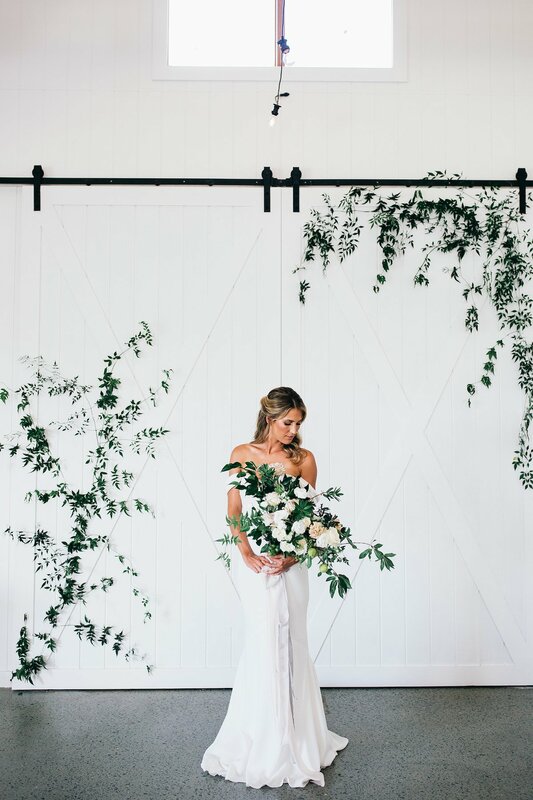 After months of anticipation, the luxe new (and totally Pinterest-worthy) Summergrove Estate white wedding barn has finally been unveiled – and we’ve got all of the need-to-know details for you right here! When we first heard that Donna, John and the Summergrove team were planning to build a barn on-site, we knew the structure was going to be something pretty special. Following the introduction of their ocean-view ceremony chapel and the successful launch of sister venue Ardeena, it seems like everything these guys touch turns to gold. 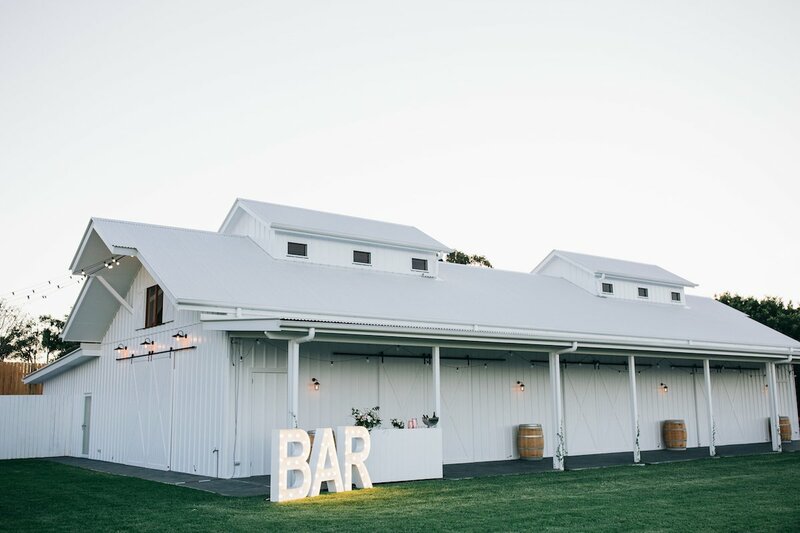 The brand new barn was finally revealed at our recent Tweed Wedding Trail event, and after all of the hype surrounding the launch (seriously – the place was buzzing! ), we were definitely not disappointed. 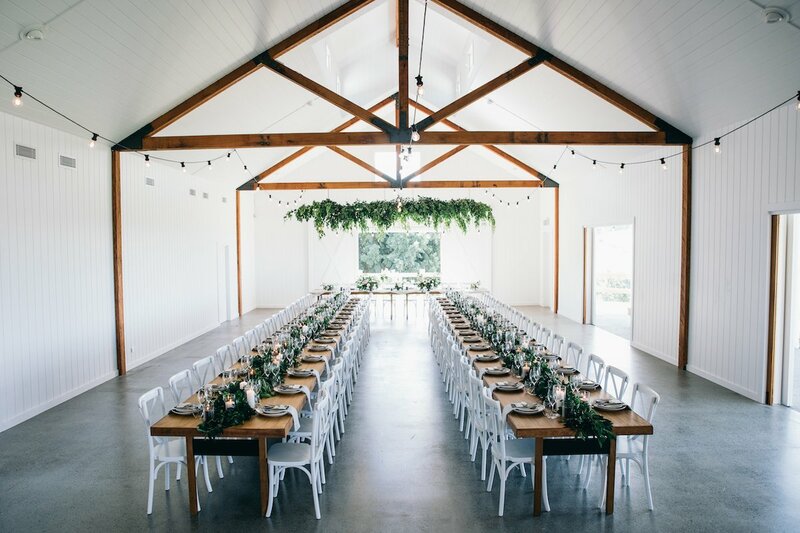 With a stunning all-white facade, light-filled interiors, wooden beams and perfectly manicured outdoor lawn, this picturesque new structure has been generating plenty of interest amongst engaged couples dreaming of a hinterland wedding on the Tweed. We recently spoke to Donna and John to learn more about the inspiration behind the design of the barn and their plans for future weddings. Keep reading as we chat to the team about what to expect from this beautiful new structure! 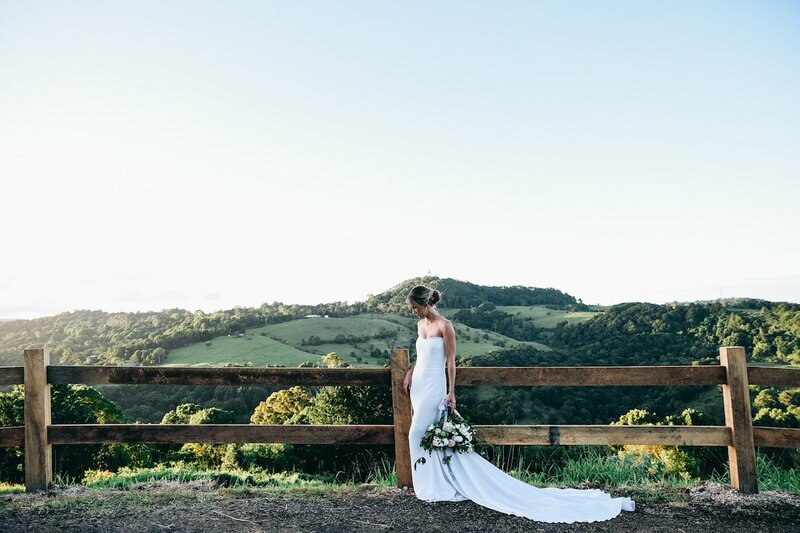 Summergrove Estate is already a highly sought-after venue for Tweed Coast couples looking to get hitched in the hinterland. What was the motivation behind creating a brand new structure at the property? 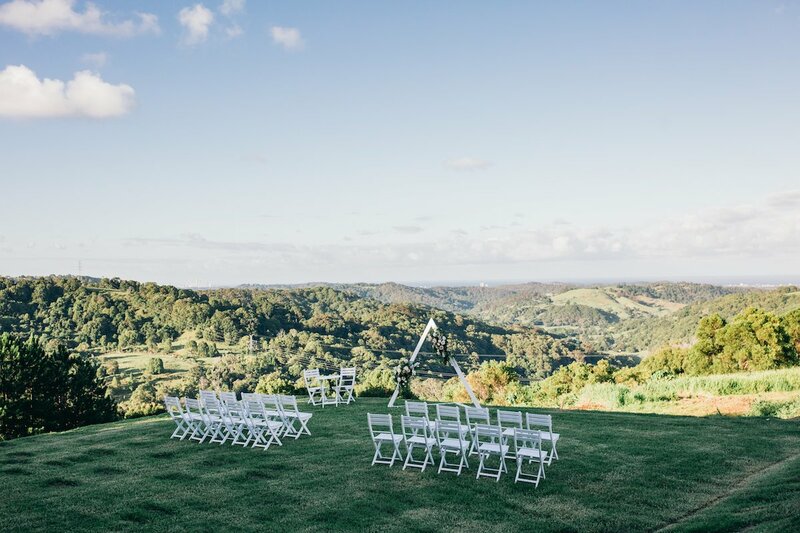 The love for our white ocean view chapel has been so wonderful, and we had the idea to create a beautiful reception space to complement the chapel, capture the amazing views across the hinterland to the ocean to the north, and to host larger seated wedding receptions. From what we’ve seen of the barn already, it’s a pretty breathtaking space. Can you talk us through your inspiration behind the design and fit-out of the new venue? Thank you so much! We were inspired by an American Equestrian Centre horse stable, all white, with the most stunning design that we fell in love with and that we hoped could make wedding dreams come true. Using this as inspiration, together with our designer and builders, we created a luxe barn offering a beautiful white blank canvas. 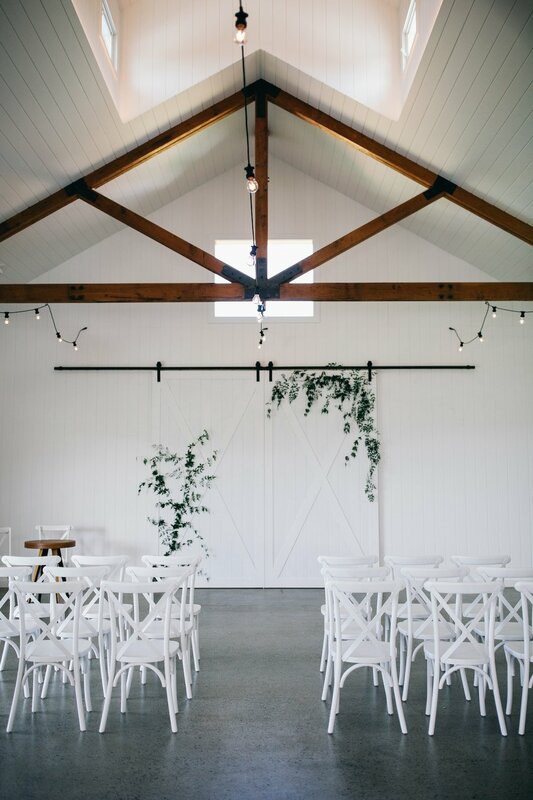 The barn is complete with feature beams and is stylish yet functional, allowing couples the creative freedom to put their own stamp on the space and to suit all styles. 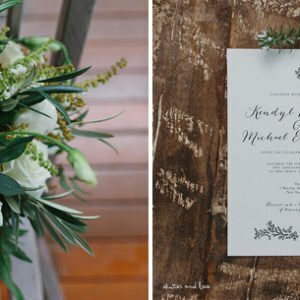 What can couples expect from a wedding at the Summergrove barn? The barn features include amazing 3-metre high barn doors at each end and along the verandah. These make for stunning photo backdrops. Within the space, we have also incorporated a timber screen which allows for the reception space to be closed off during canapes for the big room reveal once the candles are lit. It can also be used to make a dramatic entrance for the bridal party and bride and groom! 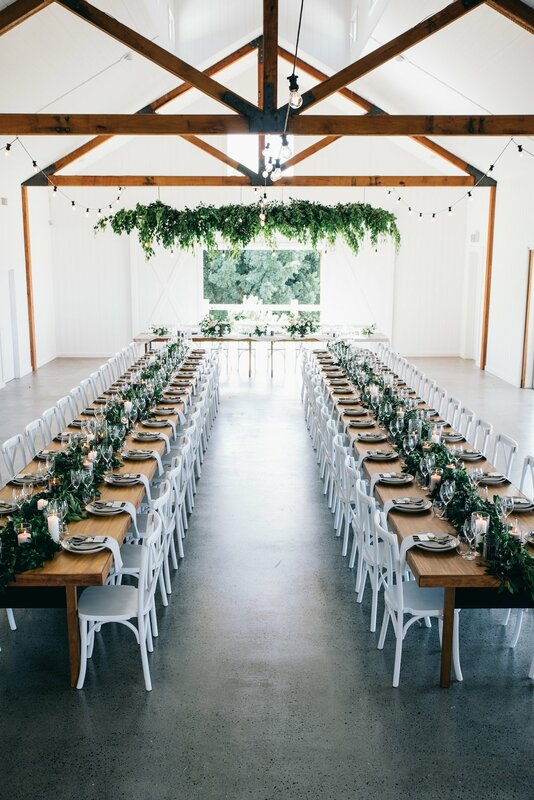 Also included in the space is a dedicated dance floor end to the building, beauty room and courtyard, state of the art kitchen and festoon lighting throughout, including a bridal table lighting feature for floral installations. For canape hour, there is a beautiful lawn area for taking in the amazing views, 25-metre verandah with tables, chairs, a champagne bar, wine barrels and a stunning side outdoor area where festoon lights fan down from the soaring roof to the lawn area. 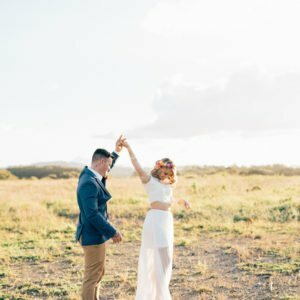 Outside of the barn, when it comes to a Summergrove wedding we have pretty much all your needs covered – from 73 acres for photos with fig trees, fields, olive groves, vineyards and ocean views, coordination to food and furniture, not to mention five of our beautiful onsite villas with spa baths looking out to the hinterland. Whilst we now have two reception spaces to choose from, we are still very much an exclusive use venue, so if our couples book the barn there will not be another wedding held on their special day. What kind of weddings are best suited for this new space? The design of the barn is suited to all styles, from luxe to boho to vintage. It’s natural beauty also complements the simplest of styling and florals. The barn can host both cocktail and seated receptions for 130 guests very comfortably. Another beautiful element that comes with the barn is having the opportunity to bring the outdoors in, with large sliding doors framing the panoramic views. Guests can also benefit from the lawn and verandah that wraps around the barn adding a perfect balance to the entire space. The barn is also a space for all seasons, with reverse cycle air conditioning throughout. Situated just 15km from the Gold Coast airport, we are positioned in a great location for interstate and overseas couples. 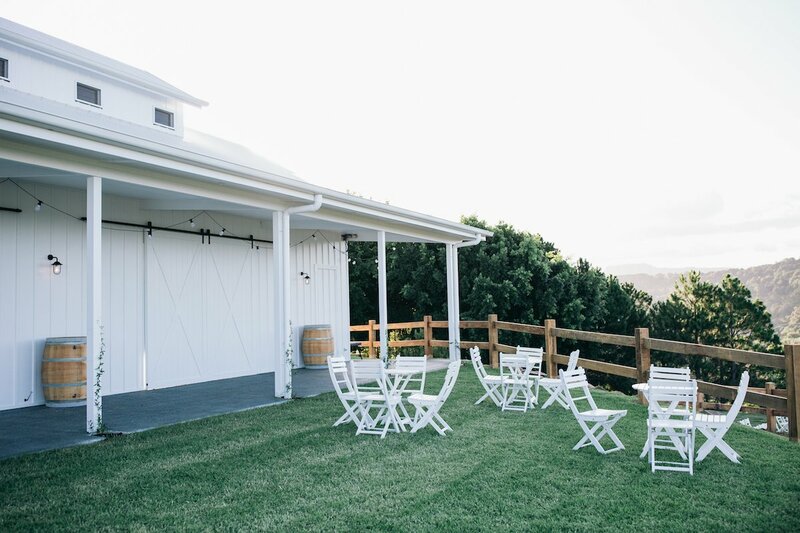 A huge congratulations to Donna, John and the Summergrove team on their exciting new addition – it’s safe to say this beautiful white barn will play host to some incredible Tweed Coast weddings in the years to come. Currently venue hunting? You can get in touch with the Summergrove Estate team via our supplier directory to book in for a site tour, or learn more about their exclusive wedding packages by downloading their function kit!